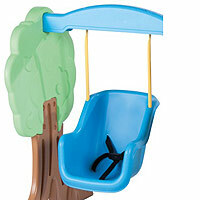 Small and compact, the Little Tikes Hide and Seek Climber and Swing may not be for everyone. However, if you are in the market for a play set for small children that will not take up much space and will work indoors or outdoors, then this might just be the toy for you. Manufactured by the popular company Little Tikes, not to be mistaken for the often misspelled Little Tykes, the Hide & Seek Climber & Swing is an easy to assemble swing set that has a sturdy and attractive design. While your bigger kids may think it is boring, kids and toddlers as little as 10 months will think it is the best toy they have ever had. Having this great set in your living room or on your back patio will not only be a great way for your kids to get exercise and improve their mobility and balance, but it will also spark imagination and creativity. 1 What is included with the LT Hide & Seek Swing & Climber Set? 2 What size is the Climber & Swing? 3 What ages can use the Hide & Seek Climber and Swing Set? 4 What do I need to put this Little Tikes swing set together? 5 What if something breaks? 6 What is the best place to purchase the Hide & Seek Climber? What is included with the LT Hide & Seek Swing & Climber Set? After looking at it, it might be hard to believe that kids will actually be able to use this set to climb, slide, and swing. But somehow Little Tikes has figured out how to put all of that fun in such a small playset. Climbing to the set’s platform is easy on the climbing rock wall that is the perfect height and angle for little beginners. Its green color is attractive and matches the tree that holds up the swing. Kids will love climbing and imagining they are on a mountain or climbing a dangerous cliff. After climbing to the platform, kids will love sliding down the gentle sloping slide. 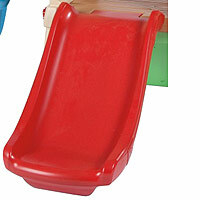 The red slide is perfect for soft landings. 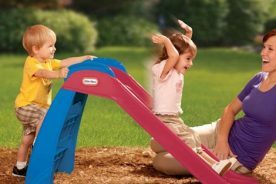 It is also a great way for kids to practice the proper way to put their feet down at the bottom of a slide so they are ready to transition to a bigger, longer slide. The blue colored swing hangs between a tree and the play platform. It swings on two straight bars instead of chains so little fingers will not be pinched. The seat is equipped with a 3-point safety belt to keep your little ones as secure as possible. The entire structure of the Hide and Seek Climber swing set has a cottage theme with a tree outside. For even more added fun, there is a great hiding spot under the platform with a tunnel to crawl out. Everything you need to assemble this lightweight, durable plastic swing set is included. What size is the Climber & Swing? 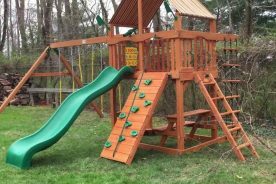 Just like many of the play sets made by Little Tikes, this one is designed to be small enough to fit in your playroom but durable enough to also be outside. It is very lightweight at only 37 pounds. After the Hide & Seek Climber is assembled it is 53 ½” long x 52” wide x 41” high. Little Tikes also makes a set that does not include the swing if you have kids who just love to climb or need something even smaller. Its dimensions are 52” long x 23” wide x 40” high. To get a better idea of how the assembled swing set might fit into your space, the following dimensions will tell you how long the slide is and the height of each of the accessories. When you purchase this play structure, whether you order it online or purchase it in a store, it does come disassembled in a cardboard box. The box is only 37.5 pounds. It is 40 ½” long x 19” wide x 30” high. What ages can use the Hide & Seek Climber and Swing Set? The recommended age range for this compact play set is 1 to 4 years old. However, if you have an adventurous baby the set is small enough for kids who are comfortable pulling themselves up or standing on their own. The swing is also secure enough with its safety belt that you could use it for younger children if you feel comfortable doing so. The weight limit on the set is 45 pounds per child and it is recommended that only 2-3 children play on it at a time. While the upper age range is 4 years old, this set may be outgrown more quickly if your kids are heavier or taller than others. In fact, many 4 year olds are ready to do larger swing set slides and you may find them not wanting to use this set nearly as often. What do I need to put this Little Tikes swing set together? Assembly of the entire set is fairly simple as there are only 10 structural components. While it is simple enough to assemble for one person, it is recommended that 2 people do the assembly so screws and bolt can be tightened properly while a second person hold the pieces in place. As long as the instructions are followed you are guaranteed to have a safe, sturdy swing set that your little ones will love. Just like all of its high-quality products, the Little Tikes Hide and Seek Climber and Swing is under a 1 year warranty from the time of purchase. 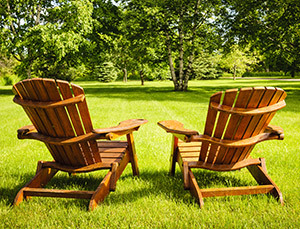 This warranty only applies to defects in the original product’s materials or workmanship. If the swing set is not assembled correctly according to the instruction the warranty is void. The warranty also does not apply to normal wear and tear, accidents, or fading from being in the sun. 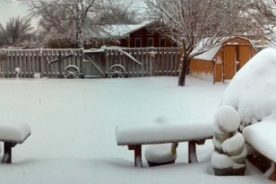 If something on your swing set is missing or broken you will need to contact the manufacturer directly for replacement parts. As long as it is under warranty Little Tikes will replace the part in question or will replace the entire set if it is necessary. 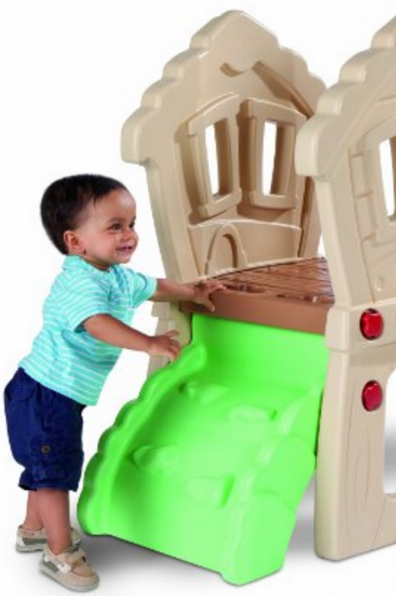 What is the best place to purchase the Hide & Seek Climber? If you have an active toddler that needs a place to climb and swing, then you will want to check out this budget-friendly, compact swing set. It is sturdy, attractive and great for indoor or outdoor use. 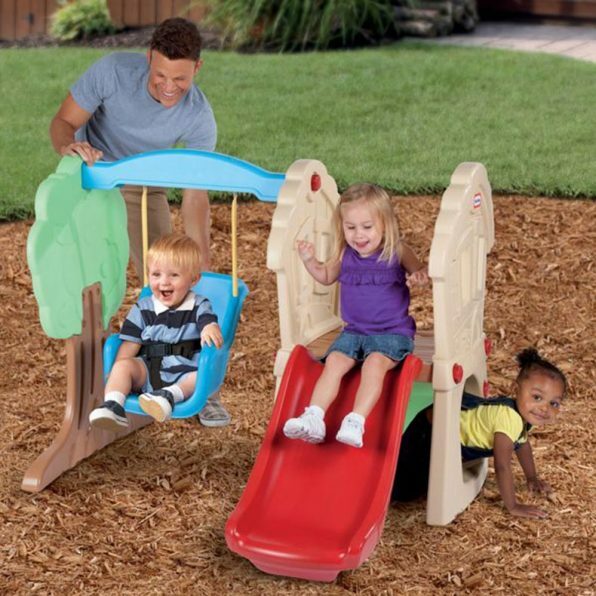 From a popular, well-known manufacturer, this Little Tikes set will not disappoint.